When we first moved into our home a little over a year ago, one of the trickiest parts was utilizing as much of our current furniture and decor as possible while keeping a cohesive feel throughout the house. Since the new house was almost double in size from the old house, there were many things purchased just to fill space. Whether a chair, lamp, or picture, it was important that the flow of each room was at least somewhat in line with the others. Our house has lots of rooms. It is the exact opposite of an open concept. With this we have both a formal living room (which is more of a music/seating area) and a great room, which I typically refer to as the den. The problem with the den is it is quite narrow. I had the hardest time picking out furniture, but that’s for another day. With the fireplace on one wall, our television on another, and a giant opening to the sunroom in the back, we had one large wall that needed to be filled. It’s typically pretty easy to fill a spot. An old painting or rustic decor usually does the trick in our house, but it can be much more daunting of a task when there is a large blank space. Luckily, I had a plan. Originally, I wanted to do this in our formal living room, but opted for the sheet music canvas art since we decided to house our musical instruments in that room. 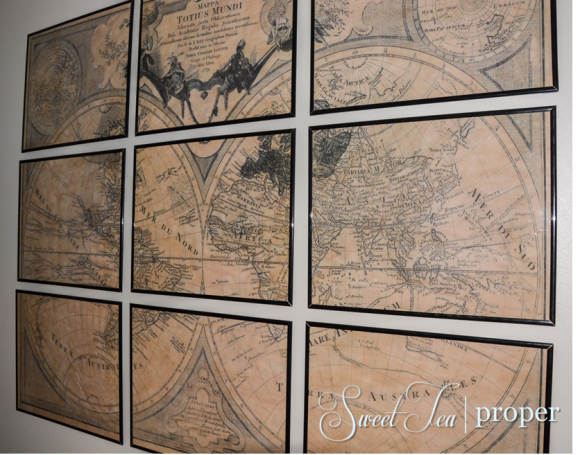 Inspired by Restoration Hardware’s L’isle’s 1720 World Map, our DIY tutorial gives you the vintage feel at a fraction of the cost. At 84″ wide and 60″ high, the RH map is huge and expensive. The cost of the map is a pricey $2,495 plus taxes and shipping. This was definitely not in the budget. I tried searching other places for something similar at a more reasonable price, but nothing really compared to this grand map. At the end of the day, creating it ourselves was definitely the way to go. 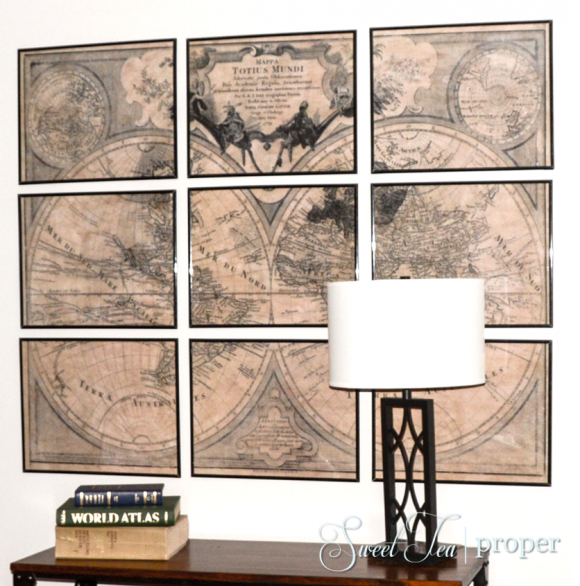 Our large framed map isn’t quite as big as the Restoration Hardware map, but with a price tag around $80, you can take the remaining $2,400 and go on a vacation! Deciding on a map is the hardest part of the whole endeavor. I narrowed it down to three before finally selecting the one we used. Since the map needs to be large, it’s important that the one you select has a high-resolution. Although the map doesn’t need to be perfectly clear, it shouldn’t be blurry when enlarged either. The best place to find pictures of maps is Wikimedia Commons. Many of the pictures and illustrations are free to use if it is for personal use. I started with a basic search for “vintage maps” and went from there. After choosing a map, check the restrictions and assuming it is fine to use, save the picture as a high-resolution JPG. For the next step, you should use whatever program you are most comfortable with. I use PowerPoint a lot so that is what I used. The purpose of this step is to enlarge the photo and split it into as many frames as you’d like. For our map, we split it into 9 sections. In PowerPoint, begin by adjusting your slide to Landscape orientation and 11″ x 14″ for the size of the slides. Add 9 blank slides to your presentation. Insert the map onto the first slide. Draw lines on top of the map similar to a tic tac toe board (9 rectangular pieces). This will give you an idea of what each section should look like. You can copy and paste the image on each slide to help figure out each section. To do this, click ctrl+a (which selects all), ctrl+c (to copy), and ctrl+v (to paste). Crop the picture where only one of the sections are showing. Delete the lines. Enlarge that section to fill the entire slide. Continue this for all of the slides. Once all 9 slides contain a different section of the map, save the presentation as a PDF to a thumb drive. Unless you have a heavy-duty printer at home, you will need to have the map pieces printed. I went to my local Office Depot and had them print the map in black and white to the specified 11″ x 14″ size for each page. This was very easy and inexpensive. The next step is critical because it is this step that gives your map a vintage look. Tea stain each section of the map and allow to completely dry. Here is a full tutorial on how to tea or coffee stain paper to look old. Once your map is complete, it’s time to frame it. I went to our local Hobby Lobby and purchased 9 – 11″ x 14″ black plastic frames. Each frame was half off and cost about $8 a piece. For 9 frames and the cost to print the map, the total map was around $80 to make. 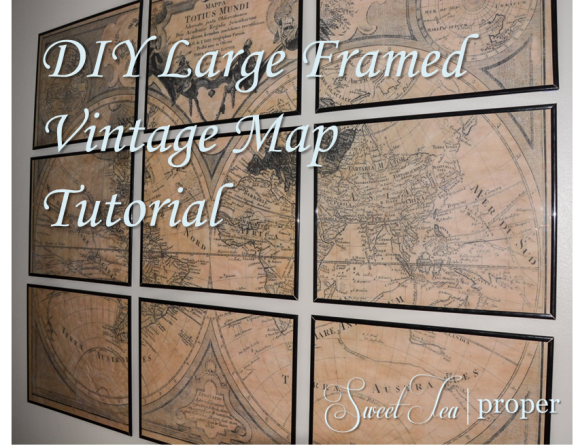 I love our vintage framed map and I wanted to complete this project at the lowest cost possible. With that said, shall we ever move, I plan on replacing the cheap plastic frames for a nicer glass version. The nicer the frame, the more authentic your map will look. Either way, if you’ve made it this far, your map is complete! I hope you love yours as much as we do ours!